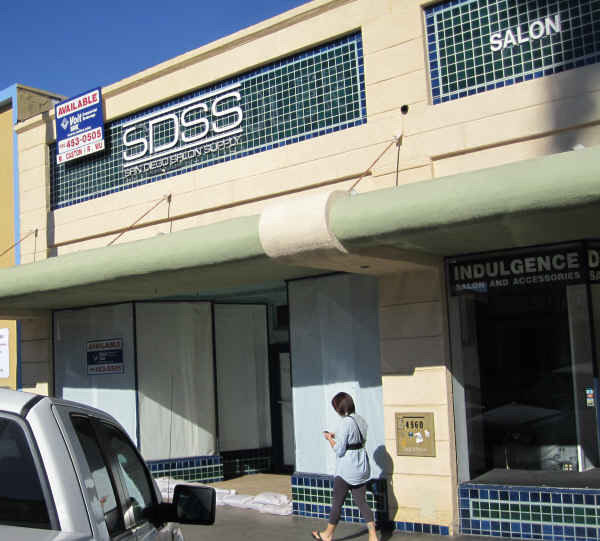 Every now and then, we’ll do a review of what’s been going down on Newport Avenue in Ocean Beach, what’s new with the businesses, who has opened, who has closed, the current rumors and attitudes. On this subject, however, we have been lax of late, so this will hopefully catch us up. Upstairs at the South Coast Bar & Grill. There are changes from one end of Newport to the other. Natch, I mean just the three blocks of merchants at the lower end of the central business street. This depressed economy is still playing a big role on our main drag. 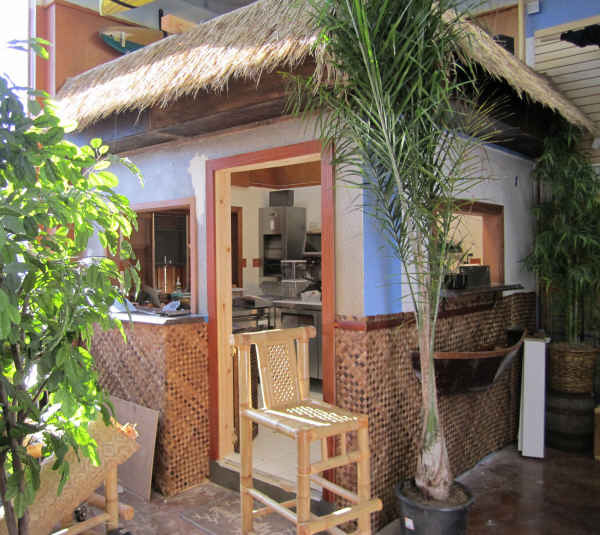 Let’s begin with the west end – nearest the beach. South Beach Bar & Grill has made big changes: it installed a ramp and windbreak at the front door with space for a couple outside tables. But the big news is the upstairs – an internal stairs leads up to a nicely-done couple of spacious rooms for patrons, with a complete bar – taking over the northwest corner of the huge two story building – which means wonderful views of the surf and pier. 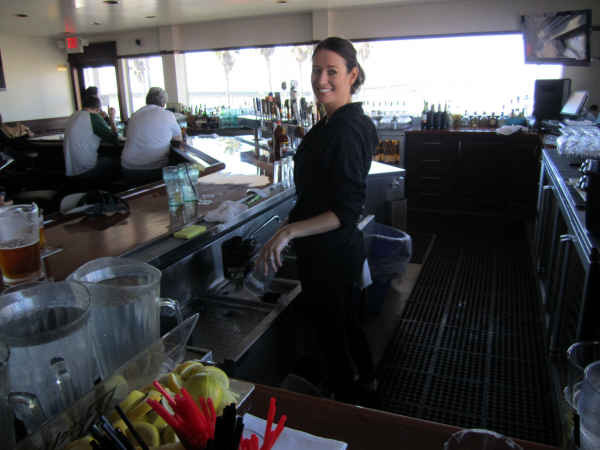 Upstairs bartender Cheryl Goulart at South Coast Bar & Grill. Manager Christina told me this all happened about 4 months ago, and the changes have been “awesome!” Business has increased. she said, and it’s all to accommodate the customers. Upstairs bartender Cheryl Goulart – who’s worked there for 10 years – told me the customers really enjoy the new space and views. 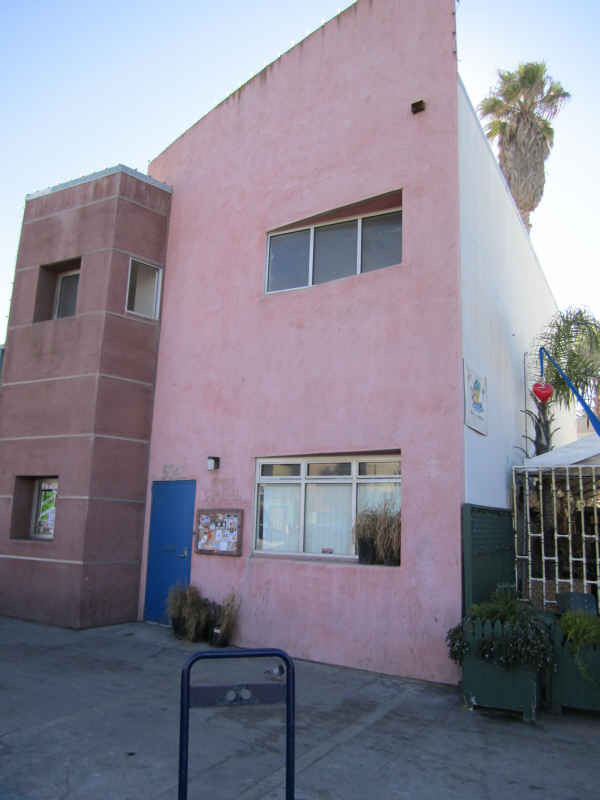 Down the block eastward stands the two story pink stucco building that had been purchased about a year ago by the owner of Newport Pizza – directly across the street-. But nothing has happened over these many months. I crossed over and talked to Megan Schuster, a manager of the pizza and beer place. She told me the owner already has an architect and plans, but because business has been slow, he’s waiting. They do have permits for alcohol and for a roof-top patio. Hopefully, she said, the place will open within a year. 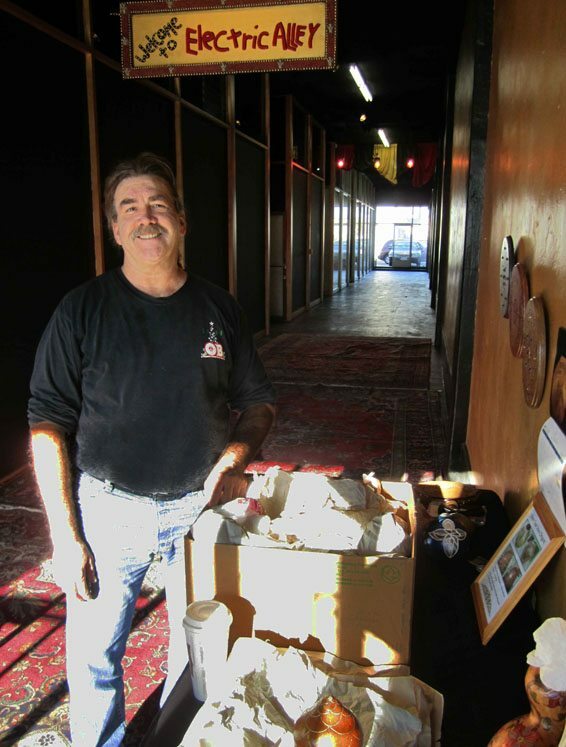 Newport Pizza owner is stalling on his new place, for good reason. He does have a permit for a rooftop patio. So, at one place, it’s booming enough to create an upstairs, but at another, it’s so slow they can’t open a new venue with an upstairs. Yet, one place just a block south from Newport has lasted for 50 plus years. 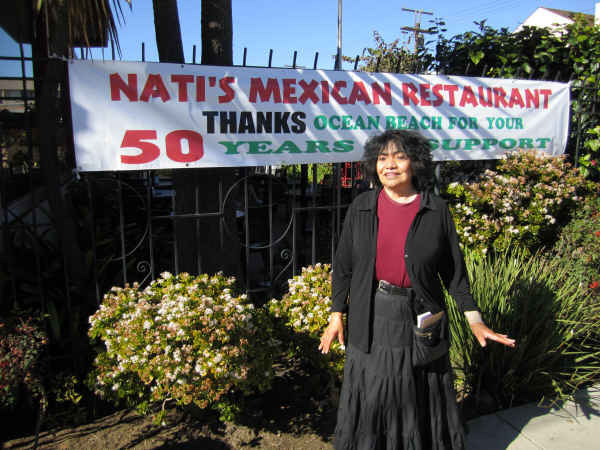 Of course, I’m talking about Nati’s at Bacon and Niagara which was the original Mexican restaurant in OB. 2010 was it’s 50th year and the banner is still up. Louisa Allen has worked there for all those years and many people know her and look forward to seeing her as their waitress. Heck, my family has been going there since the early Sixties and I remember her when I was a kid. Dennis Keer, the owner of the restaurant for some thirty years, knows he is lucky to have her. Louisa Allen has worked at Nati's for 50 years. Well, he said, a couple of things. First, the OBMA is thinking about promoting our village as the site for small conventions, groups of 30 to 80 people. This could make sense, with our great restaurants, the few hotels, the views, and of course the off-beat denizens. The idea is just being tossed around, Gary said. “Where could you hold these small conventions?” I asked. There’s the Masonic Center, he replied, the churches – they’re looking for money – there’s also several empty buildings around town. So, if you have suggestions, inquiries, or questions, call Gary at 619-347-9863 and leave a message. Secondly, Gary told me, the OBMA is trying to find more parking around Newport and the village in general. For example, the red-painted curbs at 4-way stops don’t have to be as long as the red curbs at 2-way stops. Yet right now, they are. Plus, they’re thinking about making diagonal parking on other blocks of Santa Monica Avenue. More parking would definitely be a plus for the community, although it could be tough going now driving down the 4900 block of Santa Monica due to the diagonal parking. But the village certainly needs more FREE parking. New sandwich shop getting ready to open - inside OB Surf and Skate. Back on Newport, inside the Ocean Beach Surf and Skate shop, a new sandwich storefront is about to open. It’s in the large store’s corner with a window to Newport. One of the clerks told me they expect it to open in about a week. Up the block, things have been changing at Indulgence, the hair and beauty salon owned by Franz and Marie Thome, who’ve been at their place for 20 years. Just recently, they worked out a new arrangement with their agreeable landlord, John Small, who allowed them to cut down the space they rent almost in half – which they did. Franz put up a wall, worked out a new lease, and is still in the process of re-shelving and unpacking. Franz said the economy is really still hurting businesses on Newport in general, and things have not gotten better. “Overall,” he said, “the rent prices on Newport are ridiculous, although not mine.” He told me that over these two decades, he and Marie have never had to lay off an employee, and that some years they stay in business just for the workers. They currently have 3 full-time people, plus Marie. A store front ready for rent next door to Indulgence. Meanwhile, next door, the windows and door are covered, and a for rent sign dangles from the rooftop. Franz has no idea of what if anything is going in there. “I’ll be the last to know,” he said while chuckling. Across the street, there is another boarded up store front. The old Rags place next to the arcade has had a sign up that says a new sushi restaurant is “coming soon.” Well, that sign has been up for months. What are they waiting for? Could it be a liquor license? Local artist Conway Lundquist in the artists' walkway every Wednesday during Farmers' Market. In the meantime, Paul and Lynn have opened up the arcade walk-way on Wednesdays during the Farmers’ Market as a venue for local artists. They started this in early December. When I came through, local artist Conway Lundquist was just setting up his wares. He’s a gourd and wood-carving artist. And he and a half dozen other artists will be there every Wednesday, amidst the silk hangings and oriental rugs. 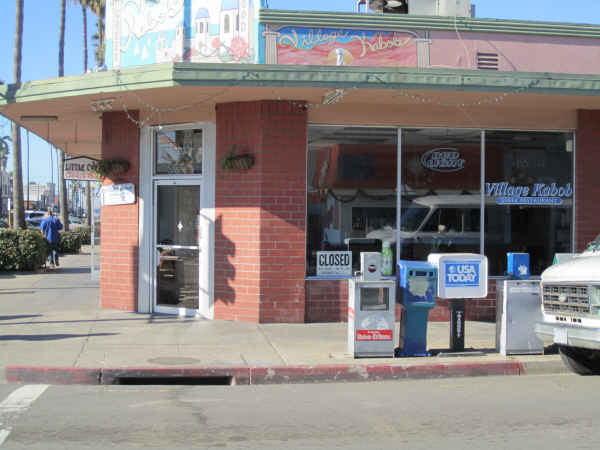 I also heard that the VFW Post that lost their lease has moved to the old Rancho’s store/ restaurant that used to be on Point Loma Avenue in south OB. I’ll have to check that out. Another restaurant that is having trouble is the Village Kabob on the corner of Newport and Cable. The site of the Little Chef for decades, the Kabob unfortunately has not appeared to be swamped with patrons over the last couple of years that it has been opened. The Village Kabob closed. Will "The Joint" microbrewery open here? A nearby business owner told me that the place has changed hands and that a liquor license notification had been up on the glass window under the name of “The Joint“, and that a microbrewery was going in there. The notification was not there when I went by, so this cannot be confirmed. Dr. Joel Kaplan's Male Enhancement clinic on Cable. Across Cable from the Village Kabob is a somewhat new storefront – the Male Enhancement shop run by Dr. Joel Kaplan, at 1917 Cable. They advertise that they are into men’s health, supplements and products. They moved in there last April, although Dr. Kaplan has had this type of mail-order business locally for nearly two decades. Kristina Clark in front of Ocean Beach Motorcycle. Down the other side of Cable, past the OB Tire store, are two new businesses. 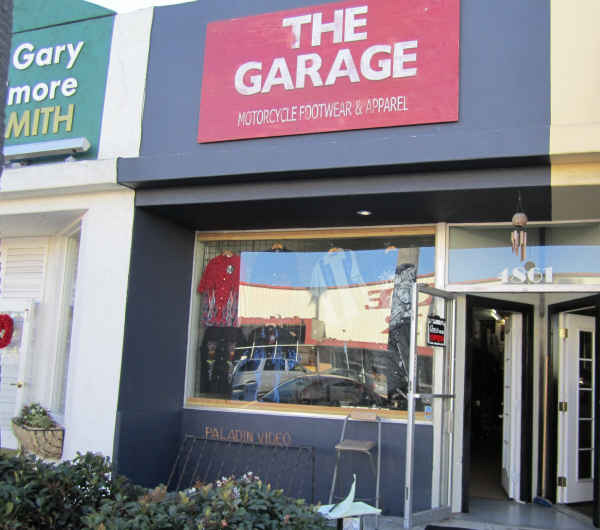 Ocean Beach Motorcycle has opened where the old skateboard shop was. Their doors were opened last August, manager Kristina Clark, told me, and they do sales and repairs. They are new to OB but business was good she said. 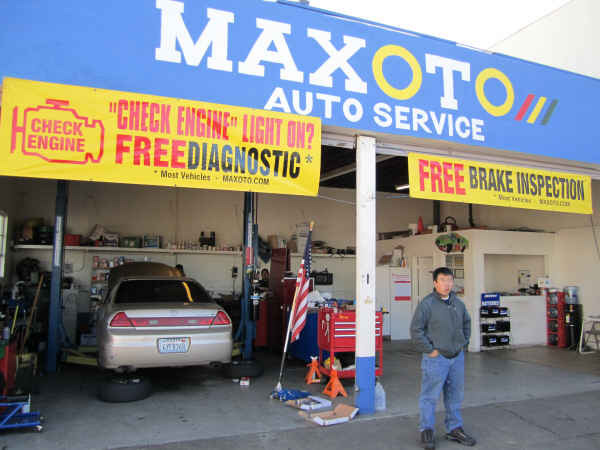 Across the alley from the motorcycle shop is Maxoto Auto Services. There manager Will Lam explained that they have three full time people working, and the new place is owned by Tuan Nguyen. Manger Will Lam in front of Maxoto. On their property but closer to Cable Street is a really cool VW bus, painted with all kinds of hippie logos. 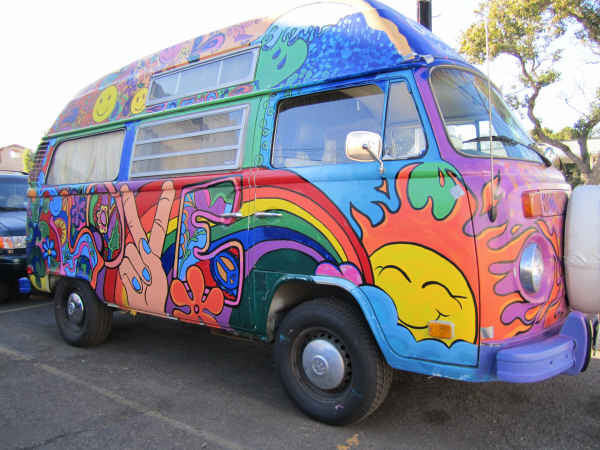 Owned by Nguyen, this bus has to rival Hodad’s Mike Hardin’s mini-VW bus that he keeps in his parking lot. You gotta check it out. Finally, at the east end of the business section of Newport, where the old Paladin stood, is the new shop, The Garage, a store front that sells leather, motorcycle apparel – plus still rents DVD’s – a holdover from the former rental place, Shane the new owner told me, although he’s not certain how much longer he will rent movies. And remember … shop local and shop often. If you can, in this economy. A new rival to Hodad's VW bus. The Garage has moved in where Paladin once stood. Overall, OB’s Main Drag is looking pretty healthy. While business still has a long way to go before it’s back to previous levels many of the merchants are reporting a decent December and, a more positive attitude among their customers. The residents of the peninsula are very loyal to the local businesses and come to Newport for not only their purchases but to get a feeling of community. I love being a part of this town. Why do you bother with the tales of woe from our local petit-bourgeoisie? Woe? I didn’t get woe from the article. Petit -Bourgeoisie…. that one always cracks me up. Gary, I think you’re thinking of the “hip-bourgeoisie”. Anarchist freak: the local petit-bourgeiosie, as you call them, are a vital and necessary element of today’s capitalist society, and at times a treasured and valuable ally to the working class and struggling masses. This sector of the economic stratum represents the small capitalists and professionals, what some would call the “upper middle-class” today. Their interests often are in conflict with the “big capitalists”, and empire-builders. Historically, many of the leaders of the workers’ and peasants’ revolutions these last hundred years came out of the petit-bourgeiosie. Not to mention that the main business street is often the “face” of a community, and if the local merchants cater to the local inhabitants, then there is a symbiotic relationship between the community’s businesses and its residents – many of whom are in the working class, retired workers, military, students – future workers, and the lower end of the professions. Therefore, the health and nature of the local merchant class is of concern to the residents. Actually, I meant to say “hip-oisie” – a combo of “hippie” and “bourgeoisie”. That always cracks Gary up. A real who’s who and what’s new on Newport Ave.! I’ve noticed many of these changes on Newport yet your detailed article puts names with the faces. a real personal touch that goes a long way in bringing the community closer. I’ll be checking out that Farmers Market Alley Walk you mentioned….hadn’t noticed that one. I had noticed the ownership change on the Village Kabob about a month ago. It did say “The Joint” was the applicant. But it was gone the last time I walked by. It’s too bad that Greek place never took off. Nice people, but they really needed a new paint job, and a maid. Everything always looked so dusty and unkempt. Last time I ate there was about 2 years ago when a roach crawled across the floor while I was eating. I’ve gotten take-out from Village Kabob a few times – too bad about their situation, they had good food and cool folks running it – but agree about the dingy feel of the interior…hard to choose that over the other dine-in options around town. Glad to see things looking up on Newport and the rest of OB. I’ll have to do a Pub crawl and hit all the new places. To bad about the Village Kabob but I am not surprised. I guess I just miss Little Chef. I guess thew white table cloths there just turned me off. Glad to see OB surf is doing well that has been a great shop for a long time. SS, let me know when you’re ready for the pub crawl and I’ll accompany you to ensure you absorb the appropriate quantity and quality. Went by the old Rancho today and the “For Rent” sign is still up. (Thursday). Hope the info is true. We need something on that corner. I’d be down for a pub crawl as well! I just need enough notice to take the night off from work! I must be getting too old for Pub crawls now. tried to do that for my bachelor party last year, and we made it to 3 bars before I had to leave. Damn my new healthy lifestyle! I just don’t have any tolerance left for partying! Ditto us! just some notice. I smell an outing in the making…of course a weekend or the eve of a holiday would be needed. Newpot pub crawl sound like a good idea. Afterwards it will be time to stumble overt to voltaire and do a pub crawl there. You’ll find me at the Stick. The only thing constant is change itself. South Coast is the surf store, South Beach is the fish taco place. Uh, thanks just 2 cents, for catchin that. Made the change. I always get those names mixed up, how embarrassing. Well, in my defense, it’s not like they offered me a drink when I was there. I get them mixed up too. Forgive me for throwing in a random political note, last I looked South Coast Surf Shop still has the hateful sticker in the windows of their two store fronts. (Let me know if you notice they are down) We used to buy gifts there and it was a regular stop for visiting friends. Now we can’t go in or let others go in. I hold out hope they will someday decide mixing bigotry and surfing isn’t cool. When they do, I’ll be happy ’cause their stores rock in every other way. Brenda, that’s great and very brave, girl! Thanks for giving support to our latent efforts to get all those stickers down. I’m with you, Brenda. I even have a $25 dollar gift card for South Coast and I won’t use it until they take the sticker down. Newport Pizza is probably watching Pizza Port, and making their next move. Hard to beat that place. Speaking of Village…..Village Kitchen cranks out a mean breakfast in half the time of other joints. Newport Ave memorial titles….what aren’t these kept up? Street food carts being gone takes away a bit of the OB flavor. Besides, we all know Voltaire is where it’s at. Tilted Stick (best wings in town), OB Quick, Tinys, Lucys, coffee carts & more. OBWarZone, obviously, it’s time for us to do a review and update about the merchants and businesses on Voltaire. Hey Ragsters! Any takers? Ahh yes, the Tilted Stick. My fave OB watering hole. Best teriaki chicken sandwich in town. Are you kidding me? Pizza Port is hard to beat? At what? We ate there last week, and it was the 2nd worst pizza I’ve ever had in my life. It was bland and doughy. Just plain awful. I actually returned it and got my money back! And the lighting in that place is as harsh as a prison lineup! I’ve eaten in high school cafeteria’s with better ambiance. Pizza port screams corporate chain. Perhaps they can put in an Olive Garden next! Newport pizza has nothing to worry about. They are still the best pizza in town. Ah yes, but Pizza Port offers Growler service! That’s hard to beat. I can walk in and get a 64 oz jug filled with fresh hoppy goodness and take it home to eat my own food! BTW Abby, did you get my bag o’ ties I left for you? Yes! I was wondering who that was! Thanks so much! Jon: You have my email address don’t you? You and the wife can drop by any time. I’m working graveyard right now, so I’m home until 11:30pm most nights. Matter of opinion. I love their pizza. I used to go to the one in Solona Beach and Carlsbad all the time. I was stoked when they finally opened on OB. Plus their beer is impossible to beat. Port Brewing is probably one of the most popular beers in SD and for good reason. Hamilton’s, The Small Bar, The Live Wire, Toronado’s just to name a few always have at least 5 Port Brew taps going. Corporate? Give me a break. They are a local company. i actually really like their black bean pizza. It’s like an open faced enchilada. Weird but surprisingly good. And they do employ a lot of locals which is always nice to see. Haven’t had that one but it sounds interesting so I will try. Thanks Frank, I enjoy reading news about Newport Ave. I’m always curious about what’s going on and your overview really is a great read. I really love Newport Ave.! I think I can tell you why Indulgence isn’t doing so well, they claim to be a beauty supply store, but they have almost no beauty supplies. In the past 3 or 4 years, every time I have gone in there, I have walked away empty handed. They have no bleach, no toner, no hair color, no loose or track hair, no streaking caps. I shouldn’t have to leave OB to get Manic Panic and pink Kanekalon. I’m not surprised they had to down size the shop, they don’t sell anything but hairbrushes and shampoo! When the merchants begin to shop local, as in carrying merchandise that is made somewhere in North America, I will be more inclined to support the “Buy Local” campaign. AWESOME PIZZA!!!!!!! So what if we’re not on Newport. Judith, thanks to you for checking in – and anytime you have an observation, idea, opinion, or thought gained from your desert “hide-a-way” – please say it here. 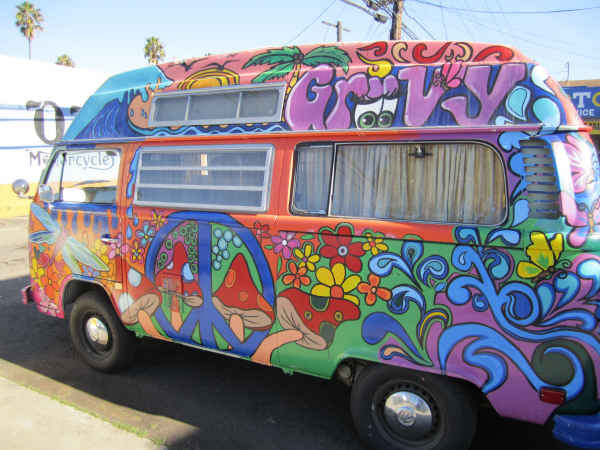 Thanks Frank for the shout out and pics of the VW Hippie Bus! Our kids at Young At Art Children’s Creative Center did a fabulous job didn’t they?! We’re super proud of all our students and the community projects they have such a passion for! And many, many thanks to Tuan at Maxoto for partnering with us and making this project possible. Great for the kids and the community!As a non-profit kids art school we’re open to and excited about other community partnerships and art projects in town!